CNG: Printed Auction CNG 75. Maxentius. AD 307-312. 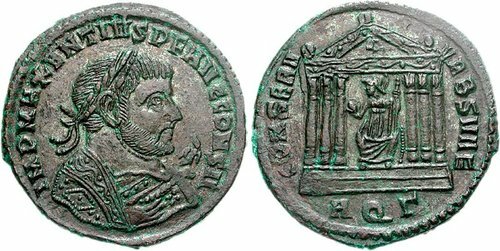 Æ Follis (7.15 g, 12h). Aquileia mint, 3rd officina. Struck AD 309. Sale: CNG 75, Lot: 1134. Estimate $400. Sold For $510. This amount does not include the buyer’s fee. Maxentius. AD 307-312. Æ Follis (7.15 g, 12h). Aquileia mint, 3rd officina. Struck AD 309. Laureate and mantled bust right, holding eagle-tipped scepter / Roma seated facing, head left, within tetrastyle temple, holding globe and scepter; AQG. RIC VI 125; Paolucci 169. EF, brown and green patina. Dated consular issue.